WELCOME TO XIAMEN DELISH AUTOMATION EQUIPMENT CO. LTD.
Xiamen Delish Automation Equipment Co. Ltd, is a reliable provider of hydraulic mini trolley that can lift and transport weight upto 400 kgs. 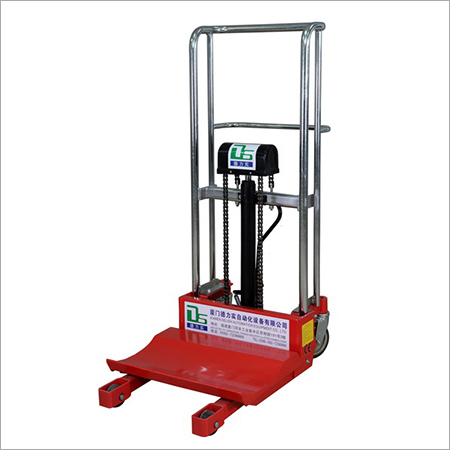 This trolley can be employed by industries for jumbo roll loading and unloading, while applying much smaller force. This lifting equipment designed for industrial logistic market, is a hand driven trolley with specific fork width and lowered fork height. Mini trolley is applicable in warehousing, retail, delivery and many other facilities. The comfortable stainless steel handle and nylon/rubber/PU wheels allow easy manual movement of the trolley. The scale on the trolley displays the weight of the rolls placed on it on the 6 digit LCD display.